Although the biggest crafting season is now upon us, I find that inspiration for fall and holiday designs have yet to cross my workspace. I’m skipping way ahead and looking forward to next year’s beading challenge, and just making lots of old favorites with new colors and textures. This month my favorite beads are all about shape and color. One of my favorite things about making netted collars is adding just the right accents to the outer edge for a fun trim, and the beads I look back on most fondly for this job are wood heishi. I recently treated myself to several strands in jet black and turquoise from Happy Mango Beads. They’re perfect for Egyptian collars, and they‘ve really been calling to me of late. While shopping around for accents that I needed for a custom piece, I came across a great little shop with lots of lovely Czech glass called The Dutch Tulip. I couldn’t resist grabbing several strands of these gorgeous multicolored lustered 3/o seed beads. They’re not that much bigger than Japanese 6/o’s, and I hope to find lots of fun ways to use them - the colors are so cheerful. I’m not sure how just yet, but I’m determined to incorporate a few of these Czech glass tubes into some Egyptian designs. The blue hues and bold shape are just what I’ve been looking for. I picked these up on sale at Fire Mountain Gems - one of my new favorite bead sites for general beading supplies. What kinds of beads are you working with right now? It’s good to be back! I recently wrapped up some really incredible custom work that’s been keeping me busy over the past few weeks. Now that things are back to normal, I have a lot of catching up to do. This means more posts to come soon, as well as new jewelry designs in the near future. Before I can get back to the Egyptian Gods challenge, I’ve got to play catch up on my inventory prep for this year’s craft fair. I’ve got about two weeks to make oodles of rings and bracelets, so I’m going all out for the next several days. I’ve also had to make some changes to my plans for the remaining Egyptian Gods pieces. I was planning to make a new collar for Ra this month, but I’m going to put it on hold until I get a few other designs out of the way first. I’d like to have at least one more chevron lariat, and Set is looking like a great source of inspiration. It’s hard to believe that this year’s beading challenge is nearly finished - it still feels as if I’m just getting started. I’ve got 9 more Egyptian Gods to work with by the end of the year, including a few of my favorites. Last week I put the finishing touches on a new chevron lariat for Ptah, the patron of artists and craftsmen. With his distinctive blue skull cap, I couldn’t resist using an abundance of cobalt white-hearts. To represent both gold and pottery, I added some terracotta and Autumn Tucson for accents, and the trio worked out really well. Since white hearts often have smaller bead holes, a stitch with few thread passes is ideal, and so I went with chevron chain once again. The beadwork comes out so slinky, it's definitely among my favorite techniques for necklaces. 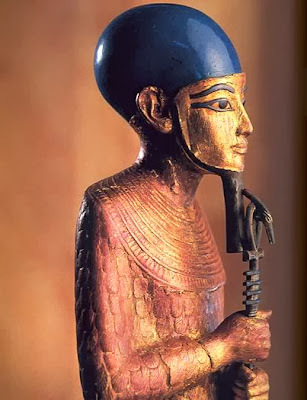 I thought that scarabs would make great accents for the god of art, as well as a few carved bone tubes. The tribal motifs and patina finish bring to mind pottery shards, or ostraca. I also included some marigold yellow white-hearts for bumpers, which almost perfectly match the Autumn Tuscon seed beads. With so many bold accents, I decided to go easy on the fringe this time around, and I like the more lightweight look for this piece. When you think of the phrase bead bible, what comes to mind? Perhaps a large tome filled with page after page of beading tips and ideas? The trouble with all-in-one beading guides is that they can be frightfully dull, like a textbook – all theory and no fun. 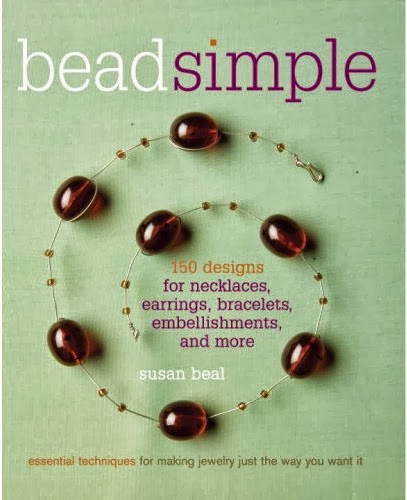 Not so with Susan Beal’s book Bead Simple, which teaches everything you need to know about the basics of making trendy jewelry, and is one hundred percent interesting from cover to cover. There are 150 designs for everything from earrings to ornaments, incorporating all of the most common beading techniques and almost every bead style imaginable. Full color photographs show every finished piece – each one stunning in its simplicity and style. Bead Simple includes a very thorough basics chapter that features clear diagrams for techniques such as using crimp beads, making wrapped loops, and even a little beadwork in the form of crossweave. There’s a quick primer on materials, tools, and beads as well as a design guide to help beginners get into the art of jewelry design. Then it’s on to the projects. There are six chapters: Earrings, Necklaces, Pendants, Brooches and Barrettes, Bracelets, and finally Embellishments – which includes a variety of wearables and home décor items. Each section features projects with a particular design element that is fully explored with several variations. Unlike many other beading books, the variations all include step-by-step instructions and a full materials list. Many projects are provided by designers such as Jennifer Perkins and Jenny Ryan. Even experienced beaders will love to flip through Bead Simple and admire the tastefully designed jewelry, using a variety of materials in perfectly balanced combinations. This is an excellent title to keep near your workspace when you need a little burst of inspiration. Actions you take from this page can result in a commission for Inspirational Beading. My bead tray is looking a little crowded this week, as I juggle several different projects. I’m still working on making new herringbone rings between designs, and I’ve also added St. Petersburg bracelets to my list of items to stock up on. Even with three quick pieces to make after each major project, I’m still looking forward to wrapping up the Egyptian Gods series at the end of the year. Next up is Ra, and I’m planning some new netting experiments that will work great for the sun god. I’m also working on samples for some custom work, and I’ve got lots of colors shuffling around as we search for the perfect palette and pattern. I really need to get around to putting away beads from my last few projects so that things feel a little less frenzied in my workspace. Sometimes it's nice just to have lots of beads to gaze at, though! Last week’s lariat is finished, and turned out great!